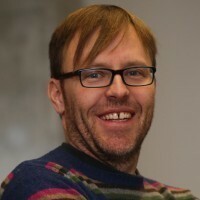 Besides his bachelor degree in music theory from the University of Calgary, Barrett Ens also holds a BSc in computer science from the University of Manitoba where he founded the hUManitech student group for exposing new students to HCI. Barrett is currently researching spatial interfaces for head-worn displays. His research draws from diverse areas including augmented reality, wearable technology, collaborative and social computing, information visualization and visual analytics, and design of novel interaction techniques. By bringing together knowledge from these areas, Barrett aims to better understand the relevant human factors for developing future computing interfaces that blend naturally into both our physical and social environments. Barrett Ens, Fraser Anderson, Tovi Grossman, Michelle Annett, Pourang Irani and George FitzMaurice. 2017. Ivy: Exploring Spatially Situated Visual Programming for Authoring and Understanding Intelligent Environments. In Proceedings of Graphice Interface (GI '17), Edmonton, Alberta. CHCCS, to appear. Barrett Ens. 2016, Spatial Analytic Interfaces. PhD Thesis, University of Manitoba. Barrett Ens, Ahmad Byagowi, Teng Han, Juan David Hincapié-Ramos, Pourang Irani. 2016. Combining Ring Input with Hand Tracking for Precise, Natural Interaction with SAIs. In Proceedings of the 4th symposium on Spatial User Interactions (SUI '16), Tokyo, Japan. ACM, to appear. Barrett Ens, David Ahlström, Pourang Irani. 2016. Moving Ahead with Peephole Pointing: Modelling Object Selection with Head-Worn Display Field of View. In Proceedings of the 4th symposium on Spatial User Interactions (SUI '16), Tokyo, Japan. ACM, to appear. Barrett Ens, Tovi Grossman, Fraser Anderson, Justin Matejka and George Fitzmaurice. 2015. Candid Interaction: Revealing Hidden Mobile and Wearable Computing Activities. In Proceedings of the 28th User Interface Software and Technology Symposium (UIST '15). Charlotte, NC, USA, 467-476. Barrett Ens, Eyal Ofek, Neil Bruce and Pourang Irani. 2015. Spatial Constancy of Surface-Embedded Layouts across Multiple Environments. In Proceedings of the 3rd symposium on Spatial User Interactions (SUI '15). Los Angeles, USA. ACM, 65-68. Barrett Ens, Juan David Hincapié-Ramos and Pourang Irani. 2014. Ethereal Planes: A Design Framework for 2D Information Spaces in 3D Mixed Reality Environments. In Proceedings of the 2nd symposium on Spatial user interactions (SUI '14). Honolulu, USA, 2-12. Barrett Ens and Pourang Irani. 2014. Personal Command and Control: A Spatial Interface for Head-Worn Displays as a Platform for Everyday Visual Analytics. In Workshop on Personal Visual Analytics (DIS '14), Vancouver, Canada. 4 Pages. Barrett Ens, Daniel Rea, Roiy Shpaner, Hadi Hemmati, James E. Young, Pourang Irani. 2014. ChronoTwigger: A Visual Analytics Tool for Understanding Source and Test Co-Evolution. In Proceedings of the 2nd IEEE Working Conference on Software Visualization (VISSOFT 2014). Victoria, Canada. IEEE, 117-126. Marcos Serrano, Barrett Ens and Pourang Irani. 2014. Exploring the Use of Hand-To-Face Input for Interacting with Head-Worn Displays. In Proceedings of the SIGCHI Conference on Human Factors and Computing Systems (CHI '14). Toronto, Canada. ACM, 3181-3190. Barrett Ens, Rasit Eskicioglu, Pourang Irani. 2012. Guidelines for Designing Awareness-Augmented Mobile DUIs. International Journal of Human-Computer Interaction, Taylor & Francis, Vol. 28, 730-736. Barrett Ens, Rasit Eskicioglu and Pourang Irani. 2011. Visually Augmented Interfaces for Co-located Mobile Collaboration. In Distributed User Interfaces: Designing Interfaces for the Distributed Ecosystem. Springer, 169-176. Barrett Ens, David Ahlström, Andy Cockburn and Pourang Irani. 2011. Characterizing User Performance with Assisted Direct Off-Screen Pointing. In Proceedings of the 13th international conference on Human computer interaction with mobile devices and services (MobileHCI '11). Stockholm, Sweden. ACM, 485-494.